This isn’t your average salmon cake recipe friends. These salmon patties are tender, oh so flakey, and bursting with spicy flavors. Whether you are looking for a new protein option to top a refreshing salad or a quick make ahead snack for meal prep, these fish cakes will never disappoint you. Not only are these simple to make, but they are loaded with healthy fats which are perfect for your ketogenic diet. Unlike other fish cake recipes, these salmon patties do not require any bread crumbs which contain too many carbs that can kick you out of ketosis. Instead, all it takes is a little bit of coconut flour and almond flour to hold these together. Aside from being so easy to put together and being keto friendly, you will also feel great about getting in all of those healthy fats that salmon is known for as well as a long list of other health benefits. Like Omega-3 fatty acids, protein is essential for your body to function optimally. Protein helps the body heal from injury, maintains and builds lean muscle, and even helps regulate the hormones that control your appetite. This is key in making you feel full and satiated which means there is less chance of overeating. Wild caught salmon can help reduce systemic inflammation and oxidative stress in your body. Fighting inflammatory responses is key for preventing the majority of diseases such as cancer, digestive disorders, and heart disease. Omega-3 healthy fats have been shown to help reduce cholesterol, strengthen cardiac muscles, reduce blood pressure, and even repair damaged tissues in your heart. Eating wild caught salmon on a regular basis may help reduce your chances of heart disease. 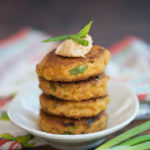 Whether you are using leftover salmon fillets or canned salmon, these salmon cakes are sure to make regular appearances to your keto meal plan. They are great reheated in a large skillet, served cold out of the fridge on a green salad, or even just on the go. Add mayo, Sriracha, smoked paprika, egg, and green onion to a large bowl. Adjust salt/pepper to taste. Add in canned salmon, almond flour, and coconut flour. Carefully stir to coat. Divide and form patties. Coat a large skillet or non-stick pan with avocado oil and set to high heat. Place patties into hot oil and cook for 3-4 minutes, flip, and cook on other side until golden brown under medium heat. Garnish with green onion if desired and serve with more chipotle mayo as your dipping sauce.